Left: Miamisburg, Ohio, pattern in 8-foot-tall corn reported on September 1, 2004, near ancient Miamisburg Mound. Length 222 feet. Aerial photograph © 2004 by Jeffrey Wilson. 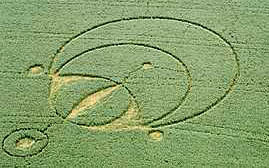 Right: Pattern discovered by soybean farmer near ancient Serpent Mound in Locust Grove, Ohio, on August 17, 2003. Length 271 feet. "Eyes" in both patterns are Vesica Pisces geometries created by overlapping circles and both patterns have two small circles outside main pattern. Aerial photograph © 2003 by Jeffrey Wilson and Roger Sugden. September 22, 2004 Ellettsville, Indiana - Back on September 8, I posted an Earthfiles about possible balls of light reported by Ted Robertson and Jeffrey Wilson of the Independent Crop Circle Research Association's (ICCRA), who investigated the Miamisburg, Ohio formation in tall corn near the ancient Miamisburg earth mound. 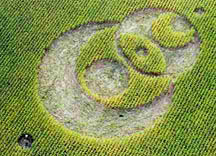 Included in that Earthfiles report was a geometry comparison between the 2004 Miamisburg Mound, Ohio, corn formation and the 2003 Serpent Mound, Ohio, soybean pattern researched and drawn by Bert Janssen of The Netherlands. The similarities shown below are remarkable.